This living fossil is classed as a deciduous conifer. The tree has got those very distinct bilobed leaves. 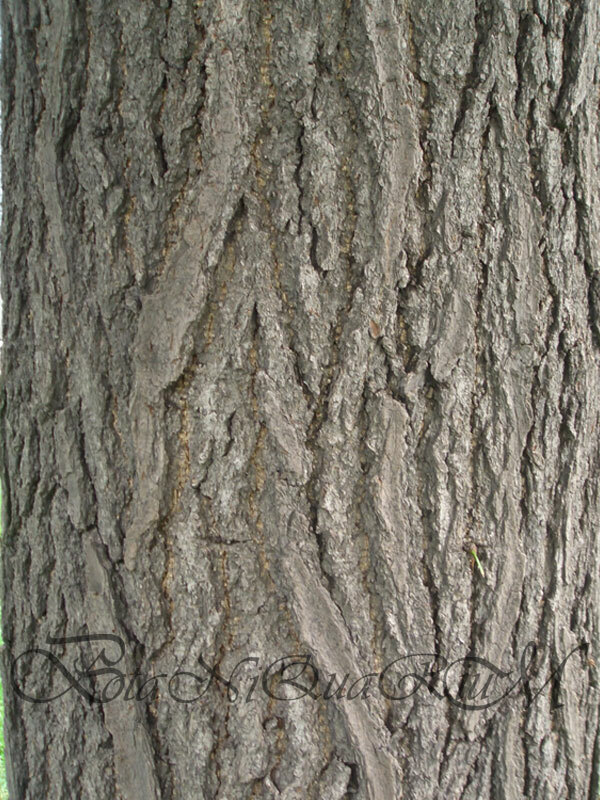 With its narrow upright habit and very robust character, it makes a brilliant tree in polluted cities. 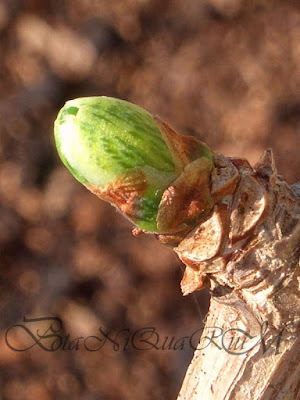 Leaf bud opening in spring. Large, deciduous tree. Botanists are debating whether Ginkgo belongs to conifers or ferns as it shows characteristics off both. 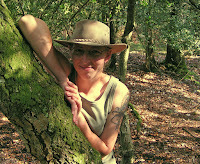 Officially classed as conifer meanwhile. Long shoots bear alternate leaves, woody spur shoots bear dense clusters of leaves. 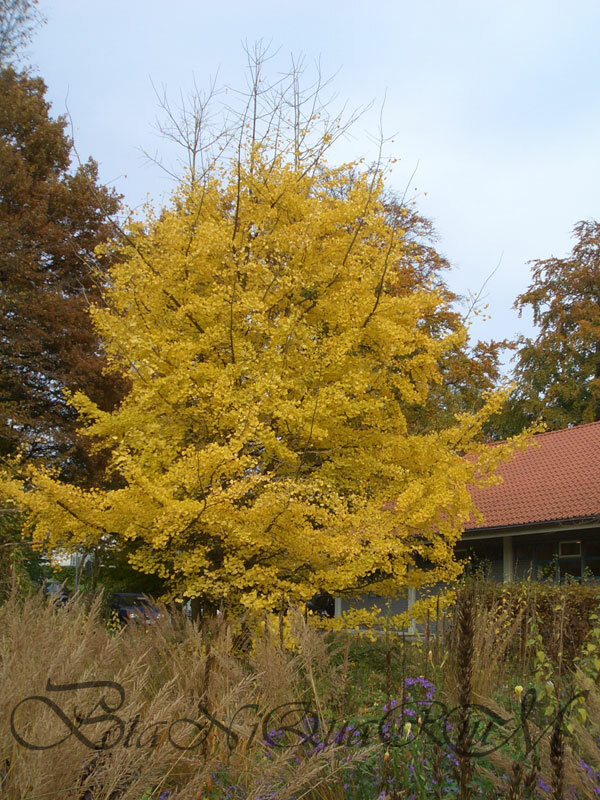 They are distinctively fan-shaped and two-lobed with parallel straight veins, fresh green in summer, a vibrant golden yellow in autumn, dioecious - catkin-like, pendulous, yellow male flowers grow in clusters, female flowers are solitary and round. 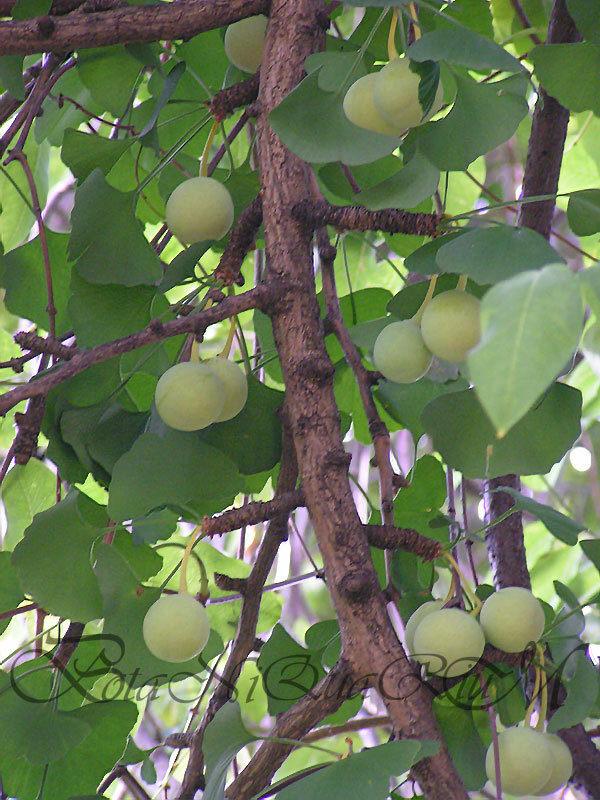 Female trees carry fleshy green fruit that ripen yellow, as they decay the flesh turns smelly, slimy and can be very slippery on the ground, contain edible nuts, that are very tasty when roasted, but care needs to be taken that the seeds are thoroughly cooked as the Ginkgotoxin may cause poisoning otherwise. 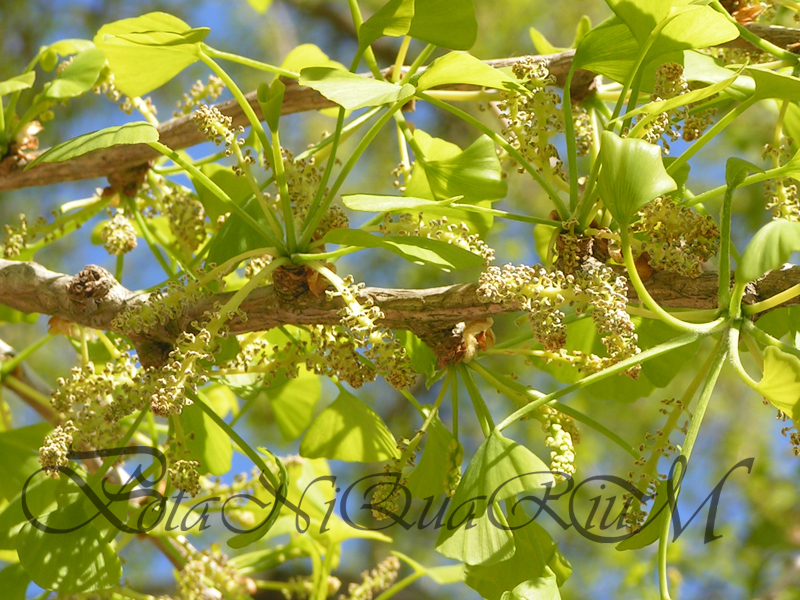 G. biloba can be extremely long-lived, the oldest recorded individual being 3500 years old. Long considered to be extinct in the wild since the Jurassic age about 190million years ago, most seem to think it survived as sacred trees in Buddhist temples (Zheijang and Anhui Provinces). The decline of Ginkgo biloba in the wild (it is native only to China) is likely to have been a result of deforestation. First introduction happened around 1754 when the first seeds were brought to Europe. Fruit on a female tree. Edible nuts inside the fruit. Newly planted trees should be staked for the first two years to avoid wind rock. After establishing remove stake. G. biloba will need very little maintenance. Generally dislikes pruning and should therefore be kept to a minimum. Branches might die back and will rarely bush out when pruned. Poorly shaped trees can rarely be improved by pruning. Any pruning should be done during the dormant season when all leaves have dropped. G. biloba has two types of shoots: slow-growing short growth and faster growing upright shoots with well-spaced alternate buds. A healthy tree maintains a balance between these two types. Easiest via seeds, which are collected in autumn. 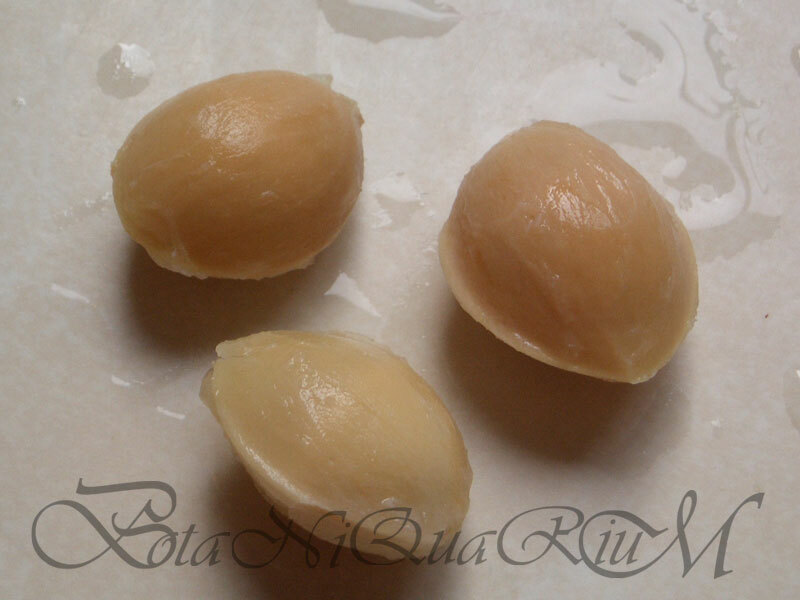 Clean off the flesh and wash the seed (nut) thoroughly with detergent to remove germination inhibitors. Sow immediately into individual pots, using a light sandy mix (1 part compost + 1 part sand). Place in cold frame, germination may take 4-6 months, sometimes even longer so don't discard too soon until the following summer. Cultivars are usually grafted using a whip-and-tongue or side-veneer graft. South East China, broadleaved forests, in moist, deep, sandy soils in full sunlight. It is uncertain whether the maidenhair tree still persists in the wild and at present there are no conservation projects in place. Cultivated trees, however, are found throughout the world, and a multi-million dollar industry has cashed in on the medicinal properties of the leaves. As a result, it is likely that this ancient tree will stand the test of time. 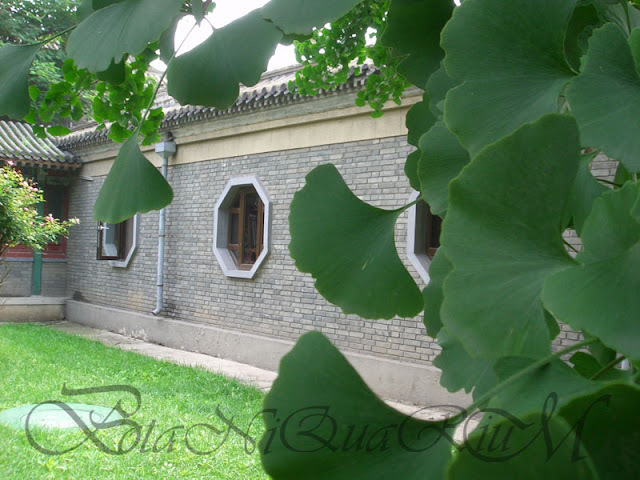 Ginkgo biloba has been used in Chinese traditional medicine for centuries. 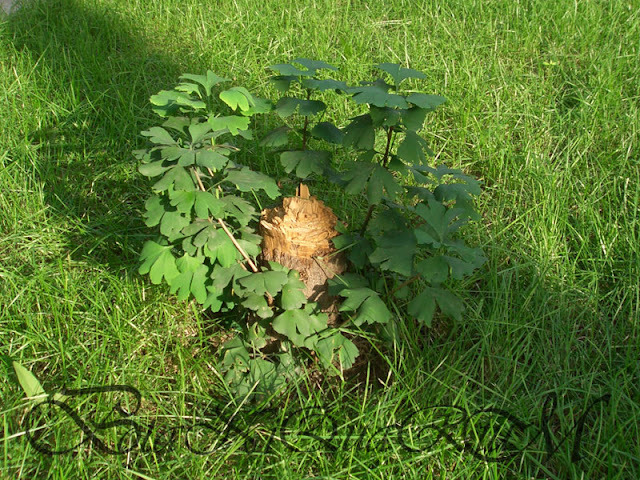 Today, it is also cultivated for use in Western medicine. 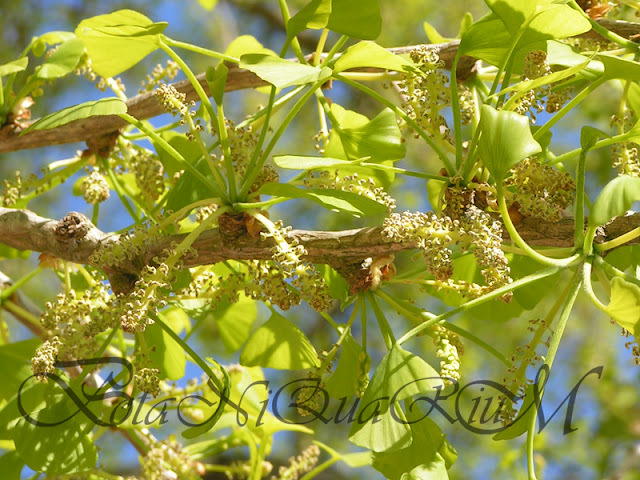 The leaves are used in herbal remedies for cognitive complaints, such as Alzheimer’s disease, dementia and vertigo. 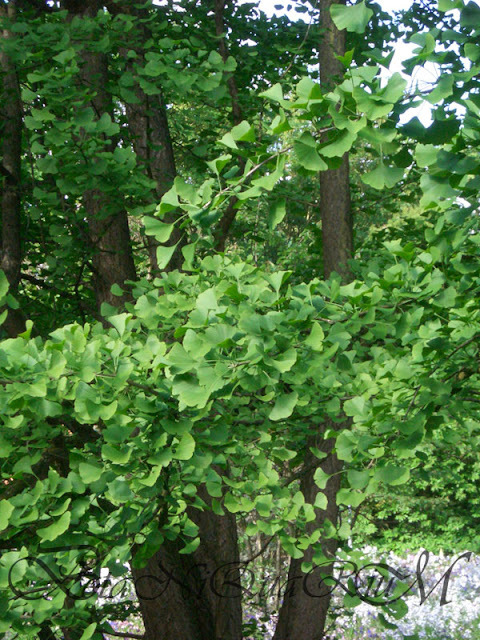 The phytochemistry and bioactivity of Ginkgo biloba have been the subject of extensive research. 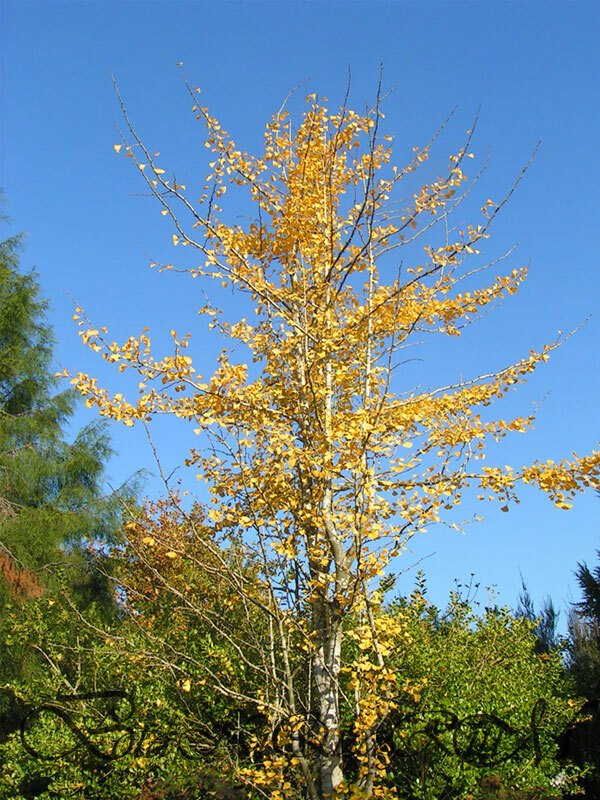 Sometimes even Ginkgo can surprise - despite its dislike towards the slightest pruning, this specimen has sprouted from the base after the top had been removed. Autumn colour on a young specimen. The ultimate height varies greatly between individual specimen since many factors influence the plant's growth and health, such as local weather conditions, light levels and soil types.